OPD has already been highly engaged in traffic safety educational and enforcement efforts such as the annual Click-it-or-Ticket campaign to increase seat belt use. However, the department has now been selected by the National Highway Traffic Safety Administration (NHTSA) and is teaming with that agency to spearhead the development and implementation of an on-going seat belt campaign to create a “seat belt community” in Owensboro that will serve as a role model for other counties, cities and states. Motor vehicle crashes continue to be a leading cause of death for the citizens of Kentucky. There were 521 motor vehicle highway fatalities in the state during 2014 (www.transportation.ky.gov). Of those 521 fatalities, 61 percent (319) were not wearing seat belts. According to NHTSA, buckling up is the most effective way to reduce fatalities and serious injuries in a crash. Lap/shoulder seat belts, when used properly, reduce the risk of fatal injury by 45 percent and the risk of moderate-to-critical injury by 50 percent. While Kentucky’s seat belt usage rate improved from 67.2 percent to 86.1 percent with the passage of its primary seat belt law in 2006, more than one in ten drivers still aren’t buckling up and more than half of all motor vehicle deaths involved an unrestrained driver or passenger. “Our goal with this campaign,” said Chief Ealum, “is to achieve 100 percent seat belt and child restraint use. We need everyone to do their part by making a conscious decision to always buckle up, to always buckle their children in appropriate and properly secured child safety seats and to ensure all other passengers ride buckled up. 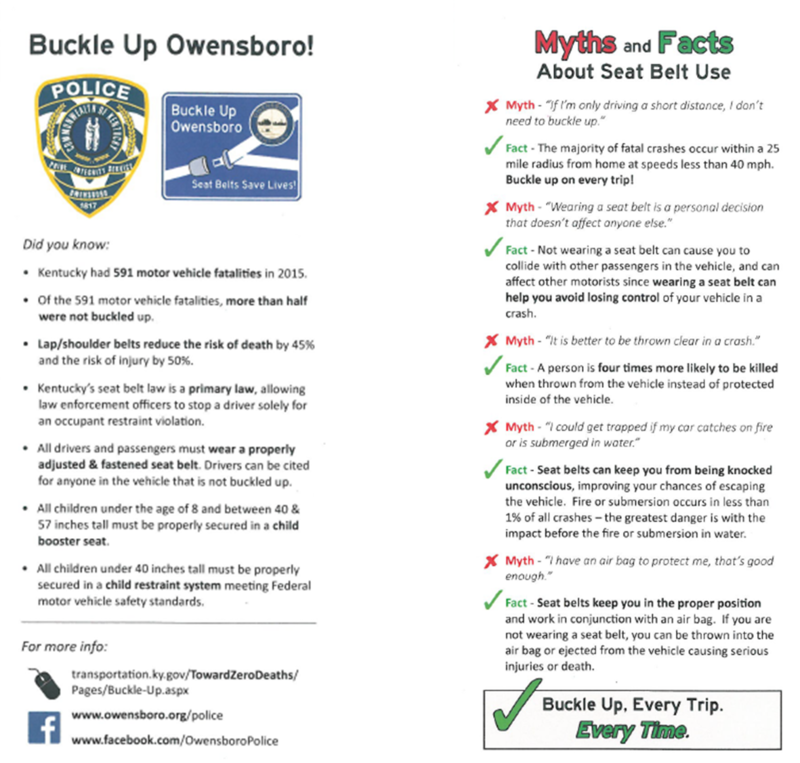 A key Buckle Up Owensboro: Seat Belts Save Lives! 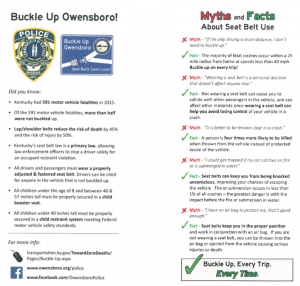 campaign element is the formation of a “Buckle Up Owensboro” Seat Belt Coalition that will be chaired by Deputy Chief Jeff Speed of the OPD and consists of community leaders and interested citizens. Working together with OPD, coalition members will reach out to high schools and local businesses to share educational materials, host events, and conduct media outreach, including on social media, to create a long-lasting, healthy traffic safety culture in Owensboro. Any driver of a motor vehicle, when transporting a child under the age of 8 years who is between 40 inches and 57 inches in height shall have the child properly secured in a child booster seat. Those who are not properly restrained can face a fine of $25. For more information or if you are interested in joining the new Coalition, please contact Lt. Gordon Black at 270-687-8827.